Two crazy lanes of heart pounding and adrenaline pumping fun! The Adrenaline Rush Obstacle Course is very challenging. You have to squeeze under obstacles by crawling low on your stomach! Next, you’ll need to stand back up and move quickly around all the obstacles you encounter. Hold back your fears as you grab hold of the rope and climb towards the rock wall slide! If you make it to the end, you have made quite the accomplishment! 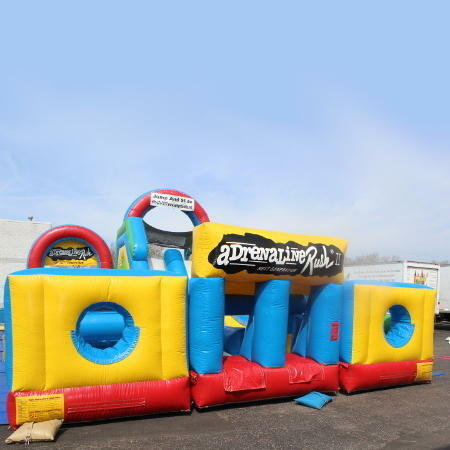 This is a fun, fast, and action-packed obstacle course! REQUIRES THREE SEPARATE OUTLETS.